Refrain from always following a predestined path for it only leads where others have already walked. The industrious volunteers at Wikiquote have listed multiple versions. I was unable to find a direct citation to the writings of Bell, so I became cautious. Also, the earliest evidence I could locate was dated 1947, yet Bell died in 1922. Could you clarify this situation? I was walking along the road one day in my country place in Nova Scotia, when the idea occurred to leave the beaten track and dive into the woods. Well, I had not gone 50 feet before I came upon a gully, and down at the bottom was a beautiful little stream. I never knew of it before. Don’t keep forever on the public road, going only where others have gone and following one after the other like a flock of sheep. Leave the beaten track occasionally and dive into the woods. Every time you do so you will be certain to find something that you have never seen before. Of course it will be a little thing, but do not ignore it. Follow it up, explore all round it: one discovery will lead to another, and before you know it you will have something worth thinking about to occupy your mind. All really big discoveries are the results of thought. 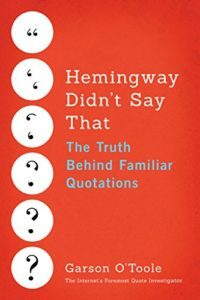 It is common for pithier quotations to be constructed by a streamlining process in which words, phrases, and sentences are omitted from a longer passage as a quote evolves.